In a large bowl, prepare the brownie mix as directed on box, using water, oil, eggs, and fold in 12 hand-crumbled Oreos at the end. or make brownies from scratch. [Recipe Here] Hand-crumble Oreos over the bowl and fold them in. Spread brownie batter in prepared pan. 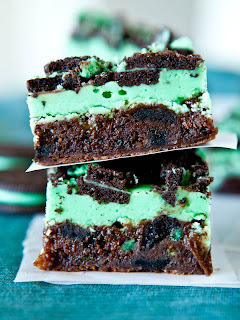 Drop about 1/2 cup of green minty marshmallow mixture onto brownie batter and reserve the remainder. Gently pull a table knife through the batter in S-shaped curves for a swirled design. Bake 22 to 24 minutes or until brownies are set, taking care not to over bake. Cool completely, about 1 hour, or put the pan into the freezer for 10 minutes if you’re rushed. In another small microwave-safe bowl, melt the white chocolate chips (microwave on high for 30 seconds; stir and microwave 30 seconds longer; stir until smooth, taking care not to scorch it as white chocolate scorches easily). Add the melted white chocolate chips and the vanilla frosting to the reserved green minty marshmallow mixture. 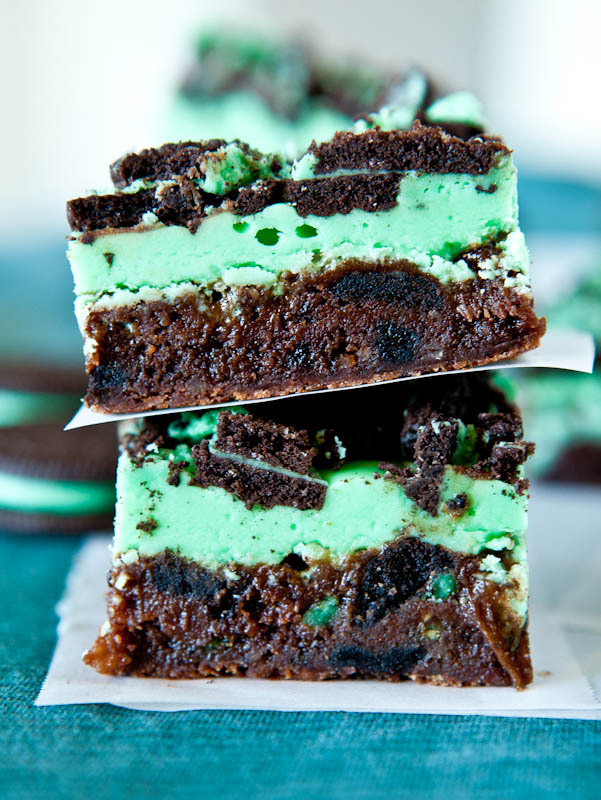 Stir in 4 drops+ food coloring, or until light green color is reached, and spread over cooled brownies. Sprinkle with 18 hand-crumbled Oreo Cookies, slightly pressing them into the green mixture. Allow top layer to set fully before slicing and serving. I prefer these bars chilled and I store them in the refrigerator in an airtight container or store in the freezer for up to 3 months. Note: Use regular Oreos if you can’t find Mint Oreos and possibly add a touch more mint extract to the ‘green minty marshmallow mixture’ in Step 1 if desired.